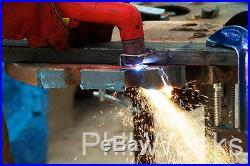 A Warrior CUT100C 100A 3 phase Plasma Cutter. 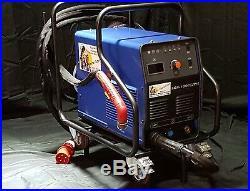 The Warrior CUT100C is an extremely reliable 3 phase plasma cutter! 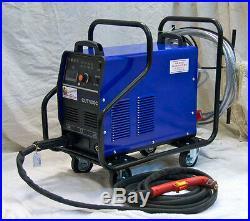 These Plasma Cutters are in daily use by our customers around the British Isles. The Warrior CUT100C fitted with a Non HF Trafimet Torch cuts cleanly through 28mm easily as some of the photographs show! The Warrior CUT100C plasma cutting system uses an inverter power source to provide a smooth DC output voltage producing excellent cut and gouge quality on mild steel, stainless steel, aluminium and other metals! Air is the primary plasma gas, providing low operating cost combined with high speed performance. Cylinder Air or Shop Air can be used as long as it is clean, dry and oil free. When properly set and maintained, the pressure regulator and gas filter on the power unit ensure that the correct pressure and flow rate is supplied to the system at the proper quantity and quality. The Warrior CUT 100C can also cut with Nitrogen when extended electrode life is a priority. The CUT 100C also features a remote control socket, and digital display. Input Votage 415V, 3 Phase. Digital Readout of preset current. Dimensions: Length 54cm x Width 28cm x Height 48cm. This machine is supplied with 3 YEAR PARTS and LABOUR guarantee (excluding consumable items). We also offer a full repair service on both this and other manufacturers machines. The price includes VAT and you will receive a full VAT invoice. Staged payments may be available, feel free to enquire for details. 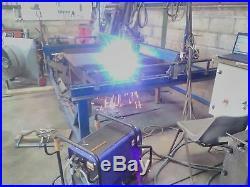 You are welcome to collect from our premises in Bath: Phil Weeks Welding Machines, 151 Locksbrook Road, Bath, BA1 3EJ. For all queries please ring 01225 312177 (Monday to Friday 8.00am - 4.00pm, Saturday 9.00 - 12.00 only). 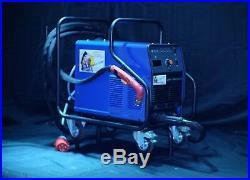 The item "3 Phase Plasma Cutter Only £1295 + VAT" is in sale since Monday, November 7, 2016. 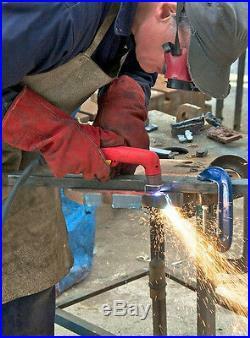 This item is in the category "Business, Office & Industrial\Metalworking/Milling/Welding\Other Metalworking Tools". The seller is "pjw6969" and is located in Bath. This item can be shipped to United Kingdom.